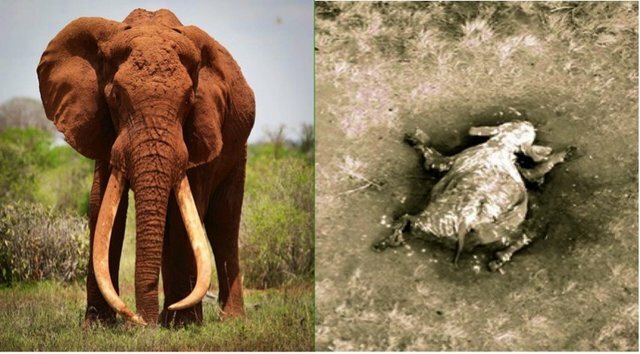 This is – was – Satao, a 54-year-old bull elephant who lived in Tsavo National Park (a supposedly protected area) in Kenya. He was killed on 12th June this year, his face chopped off for his curse of having borne such magnificent tusks. It is reported that Pope Francis has been working on a new encyclical (Papal document) on the environment  to be published early in 2015 so this is a real opportunity to put ivory on the Vatican's agenda and support a total ban on its use and trade. We know the Vatican has never condoned the use of ivory for religious purposes but nor has it explicitly spoken out against this widespread practice. Surely now is the time to do so. For many years the Philippines has been a major transit country for significant quantities of African ivory en route to the biggest ivory market of all – China. Millions of people have not yet made the link between buying a religious artifact carved in ivory and Satao's violent and bloody fate. In 2012 Bryan Christy's report in National Geographic, Ivory Worship,  exposed the extent of the demand for religious ivory within the Philippines. In fact the link between the Catholic faith and ivory is so strong among Philippino Catholics that the word for ivory – garing - also has another meaning – 'religious statue'. You might have thought that the problem of elephant poaching had been addressed with the introduction of the ivory ban in 1989, but quite the opposite. Elephants are now massacred on an industrial scale by organised gangs armed with weapons including AK-47s and rocket-propelled grenades . And why? Because ivory is now big business. Money from the ivory trade fuels transnational criminal syndicates and terrorist groups across the planet  funding arms, drugs and people trafficking activities on a global scale. The rate of killing today is increasing at such a pace that independent experts estimate that, within a decade, there will be no wild elephants left in Africa . It is the elephants of East Africa who are bearing the brunt of this mass destruction with herds in Uganda, Kenya and Tanzania being the worst affected. Between 2009 and 2013 poaching reduced the once mighty herds of the Selous region of Tanzania by 66% (as confirmed by DNA analysis of seized tusks). This decline was sufficiently alarming for the UNESCO World Heritage Committee to place the Selous Game Reserve on the List of World Heritage in Danger in June 2014 .